Drawing on three decades of songwriting, performing and arranging with the Mingus Big Band, Joe Lovano Nonet, Lionel Hampton Big Band, Carla Bley, Ray Barretto, and many others, world-renowned saxophonist and Grammy Award-winning musician, composer and arranger Steve Slagle demonstrates that it is with the understanding of the song in all its aspects that the creative musician will open the door to composition and improvisation. Using his own songs taken from his many recordings as examples, Slagle explains in detail the inner workings of each piece in terms of its melodic, harmonic, rhythmic and structural components. Sure to be an invaluable source for musicians of all levels, SCENES, SONGS & SOLOS demystifies the arts of composition and improvisation, and offers profound insight into the creative process. "Part songbook, part method book, part memoir, and part philosophical dissertation... Slagle's tunes, preceded by smart performance notes, make themselves worthy of study by utilizing common forms in interesting way... Even more penetrating-and entertainin"
"A great book full of insights and illumination... [T]ruly a labor of love put together by one of the leading jazz musicians of his generation. I highly recommend Scenes, Songs & Solos to ANY serious musician, regardless of their instrument and genre." Bobby Watson	acclaimed saxophonist, Director of Jazz Studies at the University of Missouri-Kansas City Conservatory of Music? "An impassioned book, like diving inside the composer's brain, a unique approach among the important books on this subject." 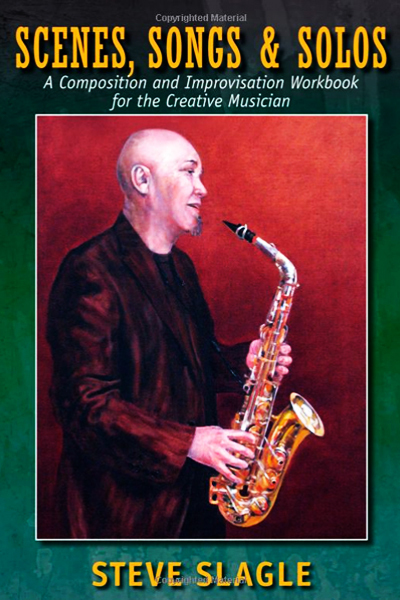 "Within these pages you will find the wisdom, insights and perspectives on life and music shared with us by one of today's leading Saxophonists, Composers and Educators on the scene. Thank You, Steve Slagle. Bravo!!!" "I loved this book! And I'm not even a professional musician. Steve Slagle is a wonderful communicator. SCENES, SONGS & SOLOS is lively and informative!" "Whenever I think there's no room for another book, someone comes up with something great. Steve Slagle's SCENES, SONGS & SOLOS, is full of fresh, original, and inspirational ideas on how to channel your creative process."